Did I buy books only because of their covers? I could say never, but that would certainly be a lie. It did happen, not very often, but it did. I can say though that for some time my criteria of buying books changed and it is not solely based on the cover artwork anymore. Although I cannot promise that would not happen again at some point in the future. Especially since covers such as the one seen in this post exist. For my today’s drooling over a cover artwork Raymond Swanland is at fault again and the publisher to be blamed is Pyr, which encouraged the artist to create yet another wonderful cover after their editions of James Barclay’s “Legends of the Raven”. I said that I no longer buy books based solely on their cover artworks, but I still stop and admire them without taking into consideration the authors’ name or the book title. At first. Because the cover artwork does more than to delight my eyes and soul, it sends me in search of information about the author and book in question, if these are a mystery to me. This is the latest case, Raymond Swanland caught my attention with his amazing cover, for almost the same familiar reasons, the attractive art, the colors and the dynamism, but sent me in search of information about K.V. Johansen and “Blackdog”. A multiple award winning and nominated author, especially for children and young adult speculative fiction, K.V. Johansen published more than ten novels, but also collections of stories, picture and non-fiction books. Pyr will release K.V. Johansen’s latest novel, “Blackdog”, in September this year and although I cannot say that the novel’s synopsis I found on their website didn’t thrill me excessively, it still made me quite curious about it. With all the honesty I say that I still ponder whether I should buy K.V. Johansen’s “Blackdog” at the moment, the mix of information about the author and novel and I admit that the cover artwork too incline the balance towards the purchase of the title. There is also an excerpt of “Blackdog” on K.V. Johansen’s website, but I wasn’t able to read it so far and can’t take it into consideration yet. But whatever my decision will be I have to say that the cover artwork did its job in this case, more so than the huge lettering that can be seen on some book covers. I mention the lettering, because it could have been the case here as well, Pyr could have opted to highlight the author’s name and the awards won by K.V. 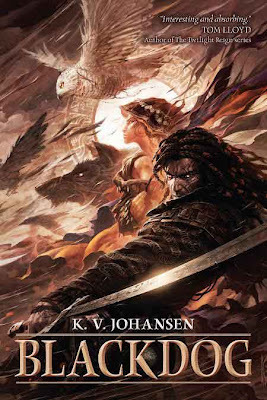 Johansen so far, but for me those would not have had the same effect as Raymond Swanland’s cover artwork. Long ago, in the days of the first kings in the north, there were seven devils. . . .In a land where gods walk on the hills and goddesses rise from river, lake, and spring, the caravan-guard Holla-Sayan, escaping a bloodily-conquered lakeside town, stops to help an abandoned child and a dying dog. The girl, though, is the incarnation of Attalissa, goddess of Lissavakail, and the dog a shape-changing guardian spirit whose origins have been forgotten. Possessed and nearly driven mad by the Blackdog, he flees to the desert road, taking the powerless avatar with him. And long ago, in the days of the first kings in the north, the seven devils, who had deceived and possessed seven of the greatest wizards of the world, were defeated and bound with the help of the Old Great Gods. . . .
Moth was once Ulfhild the King’s Sword, wizard and warrior of the north. And she was once Vartu Kingsbane, one of the seven devils of legend. Moth cares little for the fate of a minor goddess of the earth like Attalissa, but at the command of the Old Great Gods she is hunting down her former comrades, though how her enemies have compelled her obedience is a mystery even to her lover, the bear-demon Mikki. And perhaps some of the devils are free in the world, and perhaps some are working to free themselves still. . . .
Necromancy, treachery, massacres, and rebellions, gods dead or lost or mad, follow hard on the devils’ heels. But it is Attalissa herself who may be the Blackdog’s—and Holla-Sayan’s—doom.